The parties in Arbitration jointly appoint an arbitral tribunal to rule on their dispute; the tribunal will issue its award after hearing the case and examining the evidence produced by each party. The arbitral tribunal may consist of a sole Arbitrator or three Arbitrators. Where the parties have opted for three arbitrators, each party usually appoints an arbitrator and the two party-appointed arbitrators jointly select the third arbitrator (chair of the arbitral tribunal). Arbitrators are appointed among prominent professionals with wide experience and a deep knowledge of the subject-matter of the dispute. The parties are required to comply with the ruling of the arbitral tribunal (the arbitral award). The award is enforced just like a court judgment and either party may institute enforcement proceedings in case of non-compliance by the other party. Each jurisdiction has its own rules on arbitration, although most systems are based on the same set of rules (UNCITRAL model law). In Greece, domestic arbitration is regulated under Articles 867-903 of the Greek Code of Civil Procedure, while Greek Law No. 2735/1999 provides the framework for international commercial arbitration. Pursuant to the 1958 New York Convention, ratified by Greece back in 1961, arbitral awards are recognized in more than 150 countries. Arbitration is widely used in the UK and the US, Switzerland, Germany, Spain, Singapore, China etc., as a method for resolution of domestic and international commercial disputes. An arbitral tribunal will hear the case and examine evidence, following which it will rule on the case by means of an arbitral award that is binding on the parties. A mediator, on the other hand, does not issue a decision nor does he or she impose any solution; he or she will actually assist the parties in reaching a negotiated resolution agreement themselves. A detailed comparison between Mediation and Arbitration is available here. For further information on Mediation please press here. Commercial Arbitration emerged in England towards the end of the 18th century, but really took off, reaching its current status, throughout the 20th century. Thus, the few past decades have passed down a successful arbitration model, whereby an arbitral tribunal issues an award with the validity of a court decision. Because of its various advantages, commercial arbitration is seemingly becoming the preferred dispute resolution method for disputes arising from all types of commercial transactions; parties doing business together often opt for including an arbitration clause in their business contracts, to prevent complexities by making sure in advance that any dispute arising from the transaction in question will be resolved by recourse to arbitration. Commercial Arbitration is used to resolve a wide spectrum of commercial disputes; it should be distinguished from other types of arbitration, such as sports arbitration, labor arbitration or consumer arbitration. The arbitral award is considered an enforceable title under the applicable law. In case of non-compliance of the other party, you can directly seek its enforcement in court. Attractive timeframe of the arbitral proceedings, which are concluded within 6 months of constitution of the arbitral tribunal (an extension can be granted upon agreement of the parties or at the discretion of the tribunal). Cost-effective in comparison to litigation. Prominent Arbitrators from Greece and abroad, whose services are available at very competitive fees. The members of the arbitral tribunal are appointed among Arbitrators included in the EODID roster of neutrals; the parties may opt for an Arbitrator not included in our roster. Where necessary, the EODID Arbitration Board assists the parties in appointing an arbitral tribunal which meets the requirements of independence and impartiality, taking into account the particular features of the case. Entrusting the dispute to the legal expertise of the arbitral tribunal provides a guarantee of protection of your legal rights. Pursuant to the EODID Arbitration Rules, unless otherwise agreed by the parties, all those involved in the arbitral proceedings under any capacity whatsoever are bound by confidentiality requirements; this duty persists after conclusion of the proceedings. If you want to send us a Mediation or Arbitration request, please press here. The EODID Arbitration Rules are the outcome of several months’ work by a group comprising retired Judges, and active Academics and Lawyers with high expertise and wide experience in arbitration in Greece and abroad. The Arbitration Rules are fully in compliance with the best practices of the most successful international arbitration centers worldwide. Prior to their publication, the EODID Arbitration Rules have been reviewed by several legal counsels and businessmen, in order to ensure that they are in line with the real needs and current potential of the Greek and international legal and business community. 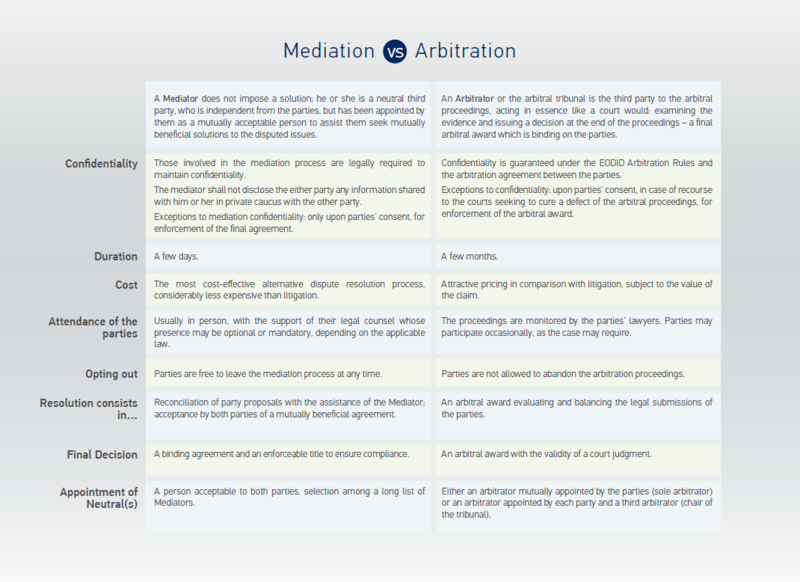 Within the applicable legal framework, the EODID Arbitration Rules offer interested parties a flexible set of guidelines to resolve their dispute through arbitration. Other professionals experienced in arbitration and dispute resolution in their respective industries (shipping, energy, construction etc.). See the list of EODID Arbitrators to nominate or appoint an arbitrator for your case, or contact us to request the assistance of the Arbitration Board for appointment of an arbitral tribunal. For further information please consult the EODID Arbitration Rules and the Internal Rules of the EODID Arbitration Board (Annex III to the Arbitration Rules). Other support services needed throughout the course of arbitral proceedings. Contact us if you are interested in using Arbitration to resolve your dispute. Access to legal library and database (Greek law journals, manuals, legislation compendiums and commentaries). Contact us to benefit from the housing & accommodation services offered. Fixed reduced rates for the entire process. Contact us to submit a Fast Track Arbitration Request with EODID Athens. 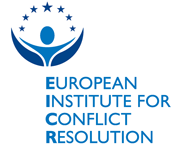 EODID Athens offers a structured combination of both dispute resolution methods, on the basis of its Mediation and Arbitration Rules. The dispute is thus “divided” in smaller parts, each to be submitted the process that best matches its circumstances. The parties may opt for the combined use of Mediation and Arbitration at the beginning of the resolution process, or after an independent mediation or arbitration process has been initiated. Amicable resolution of matters that can be resolved in Mediation, with a guarantee of resolution of the remaining matters by an Arbitral Tribunal. The Mediator who handled the case in the mediation part of Med-Arb cannot be appointed as Arbitrator in that same case. The parties are free to request the mediator to submit to the arbitral tribunal a report on the facts of the case, for acceleration purposes. The report does not cover confidential information disclosed to the mediator. Upon initiation of the Arbitral proceedings the parties agree that should an amicable settlement opportunity arise, the arbitration shall be interrupted, and a mediation process shall be initiated. The members or chair of the arbitral tribunal cannot be selected as Mediators in this case. The arbitral tribunal refrains from all steps of the mediation process. It resumes its activity following conclusion of the mediation, to rule on any matter not resolved in mediation. EODID Athens offers interested parties the opportunity to consult a neutral expert with regard to the possible outcome of their case in the event that it were to be brought to litigation or arbitration. The interested party selects a neutral expert among the individuals included in the EODID list of Arbitrators, and submits to EODID Athens the particulars of the case. EODID Athens transmits the file to the Expert, who in turn files with EODID a report in writing, within 30 days of receipt of the particulars of the case. Depending on the circumstances of the case (i.e. in case the interested party has submitted an active dispute), the report may include a non-binding resolution proposal or a referral to mediation. With a view to ensuring impartiality and neutrality, the neutral expert cannot be subsequently appointed as mediator or arbitrator to resolve that same dispute previously submitted to their expertise. The remuneration of the neutral expert is agreed on a case by case basis between EODID Athens and the interested parties. An EODID Arbitration clause has been included in a contract between the parties, which is the origin of the dispute to be resolved. In the alternative, the parties have signed an agreement to arbitrate, whereby they have opted to submit an existing dispute to EODID Arbitration. Please consult your lawyer to adapt the EODID model Arbitration Clause to the circumstances of your case. The “applicant” submits to EODID Athens a Request to Arbitrate (in person or by postal mail), making sure to provide the necessary number of copies (one copy for each party to the dispute, one copy for each arbitrator and one copy for EODID Athens). EODID Athens certifies the copies and the applicant undertakes to notify the respondent of the Request; the respondent will then submit a Response to the request to arbitrate. EODID Athens monitors the exchange of introductory briefs and makes all necessary arrangements for the appointment of arbitrators. In case of a sole arbitrator, the parties agree to an arbitrator; if they cannot reach agreement, they entrust the EODID Arbitration Board with the appointment of the arbitrator. In case of a three-member arbitral tribunal, each party appoints an arbitrator. Those two arbitrators jointly appoint the third arbitrator (chair of the arbitral tribunal). If they cannot reach agreement, the chair of the tribunal is appointed by the EODID Arbitration Board. Once nominated arbitrators confirm their availability and the lack of any conflict of interest preventing them from confirming their participation, a preliminary meeting is held. The preliminary meeting is to be scheduled within 15 days of constitution of the arbitral tribunal, its main purpose being setting the procedural norms and the schedule of the arbitral proceedings. In accordance with the outcome of the preliminary meeting, the main part of the arbitral proceedings is held, including for example filing of pleadings and evidence by both parties, as well as one or more hearings, if required. The arbitral tribunal notifies the parties and EODID Athens when it deems that all necessary steps have been taken and an award can now be issued. The arbitral tribunal rules on the dispute brought before it by means of an arbitral award. EODID Athens notifies the parties of the arbitral award. The arbitral award is issued within 6 months of the constitution of the arbitral tribunal. This period is extendable upon agreement of the parties or at the discretion of the tribunal with a view to accommodating the particular circumstances of each case. Arbitrator fees for hearing and processing the dispute are established based on the value of the claim and depend on the number of arbitrators constituting the arbitral tribunal (sole arbitrator or three-member tribunal). Administrative fees are established based on the value of the claim, and cover the organizational needs of the proceedings and the administrative support provided until the issue of the arbitral award. The total amount of Housing & Accommodation expenses depends on the number of hearings and deliberations held throughout the arbitral proceedings. For legal assistance services provided throughout the arbitral proceedings. Established on the basis of the particular needs of each case, if applicable. Examples of such fees include those corresponding to expert evidence, interpretation and translation services etc. Read more about the EODID Athens arbitration costs & fees policy (Annex V to the Arbitration Rules) and contact us to be informed of the total cost of arbitration for resolution of your dispute.